Spring is a great time to talk to your group about these three foundational activities of a LIFEGroup. Discuss how you are presently accomplishing them, and what you might do this summer and fall to better accomplish these vital experiences. i've never made a secret of the idea that one of my favorite authors is james m. boice. his commentaries are a staple of my Bible study diet, and his Foundations of the Christian Faith is my systematic theology of choice. I'm reading a book right now entitled Why Small Groups? It's a good read from a lot of sound theological thinkers. to extend the pastoral ministry of our church...by providing a context...in which to apply God's Word...so that growth, care, and relationships may occur. 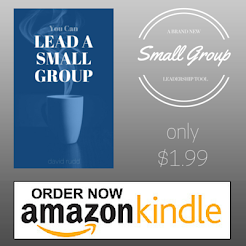 "I don't think that's a bad statement of the role of a small group leader! The sermon audio is not there yet, but will be shortly. You might not agree with everything you find, but you'll find a lot that will help you! a) taking the surveys as they are offered. b) encouraging your LIFEGroup members to take the surveys. c) emailing the survey link to those in your group and others you know who may not be connected.The most recent survey is available at the church website (calvarymuskegon.com), just click on the link that says "survey". Don't forget that the Justice and Mercy series starts this Sunday! If your group hasn't confirmed your plans with Jacquie, please take the time to call her this week. Find out more about Justice and Mercy here. 1) Why was God so upset with Israel? 2) What did God want Israel to do? 3) What type of behavior could keep God from being pleased with our worship? What would it take for Calvary to be a church West Michigan thanked God for? It can be difficult to concentrate on Bible-study or small-group discussion when your mind is still occupied with the worries of the day. To help members of our small group shift attention from personal concerns to Bible study, we created a worry jar. At the start of each meeting, we pass around slips of paper. On them, we write down whatever is on our minds. Then we fold the slips and place them in a large jar. Tangibly releasing our worries in this way reminds us that we can give our cares to God. It enables us to acknowledge and set aside potential distractions so we can focus on the study. Because we don't share our worries aloud, group members feel free to write even the most personal concerns. Although our group leaves the slips of paper in the jar and adds to them each week (we plan to burn them at the end of our study), you might wish to discard them after each meeting.